Turid Rugaas is a Norwegian dog trainer who took in a stray little Elkhound named Vesla. While observing Vesla's behaviour with other dogs change over time -- from aggression and violence to calm communication with others -- Rugaas discovered that dogs have behaviours they use in stressful situations to calm both themselves and others around them down. She calls these 'calming signals'. Rugaas was encouraged to write her theory on calming signals down, so she wrote On Talking Terms with Dogs: Calming Signals. 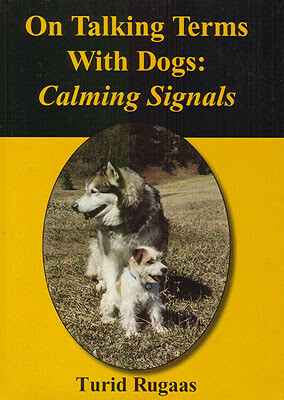 The book is a short and easy read, because it's essentially a list of calming signals and how dogs use them. There is also a sentence on each signal suggesting how humans can use it, and this is furthered in the third chapter titled 'Case Histories' which gives examples of how she has used calming signals to rehabilitate her clients, who tend to be fearful or aggressive dogs. 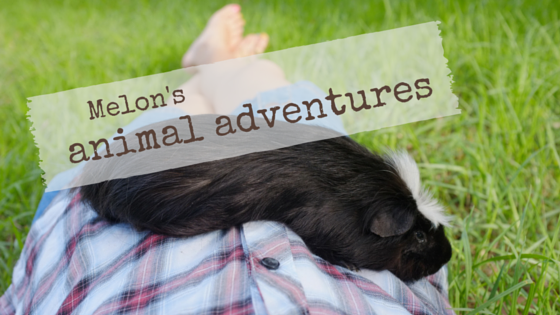 It was a fun read really -- haven't we all wished we knew exactly what dogs were saying? But in fact I think Rugaas deserves credit for not writing/marketing this book as a dictionary translating dog language. At least, I didn't get that impression. On a second read, I discovered she does claim that calming signals apply universally to all dogs (and wolves), that they will tell us what dogs are feeling, and encourages us to observe and use them ourselves. But I didn't get the impression of any ego involved at all. Even if the exact words say otherwise, I'm left feeling that the book doesn't claim any more than it should. All it says is what Rugaas has observed and used. I have no idea if calming signals really exist or work the way Rugaas says they do. I don't have and have never had a dog of my own to observe. But I will certainly start following her suggested method of training myself to look for them, because the humble way Rugaas presents her observations in this book gives me the feeling they just might be accurate. Are you aware of behaviours your dogs display when they are stressed? Are you aware of ways your dogs communicate to other dogs? What happens when you use them yourself? I really liked this book when I read it. I don't know if it helps to display calming signals to dogs ourselves as she suggests, but it is interesting to watch for them in our dogs. I think I need to get myself a copy of the book to keep to help me remember what I should be looking for. As for doing them myself - yawning has never done anything; Gatsby actually did lie down instantly despite being spooked when I sat cross-legged and stretched my arms out onto the floor [think the human version of a play bow], but Penne always runs over to jump on me excitedly when I do that. Huh!